Yure Project: 1,000 People Nationwide Share Shaking and Quaking Observations – Weathernews Inc.
Weathernews Inc. (Tokyo, Japan – CEO: Chihito Kusabiraki) is launching its Yure Project on National Disaster Prevention Day together with 1,000 supporters nationwide. Yure (pronounced: Yoo-ray) means “shake” or “quake” in Japanese, so goal of the project is to measure local vibrations using the specially developed Yure Station, which will transmit vibration data measured with a built-in G-sensor a via the internet. The data Weathernews receives from the Yure Stations installed across the country will be used to generate content available on the Yure Project website. 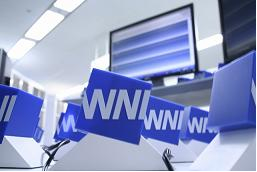 The project began initially in June 2008 with the distribution of 200 Yure Stations to participating Supporters (customers), with another 800 sensors following in July. With a total 1,000 specialized vibration sensors distributed to Supporters and in place at their homes, Weathernews can begin real-time monitoring of local vibrations from earthquakes and other sources like transportation (trains, highways, construction, etc.). The data gathered by this project and published on the internet will lead to developing a higher awareness of “Shaking and Quaking” for disaster mitigation. What is the Yure Project? The Yure Project uses a specially developed sensor called the “Yure Station” to measure local vibrations across Japan. 1,000 of these Yure Stations are distributed to Weathernews supporters, and installed in their home to create a network that provides data in real-time on shaking and quaking. 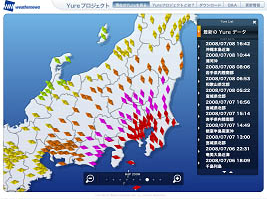 The data collected is made available on a special area of Weathernews’ website (http://weathernews.jp/yure/) where people can see finely detailed information on local vibrations. This data is supplemental to verified information used by “The Last 10-Seconds,” an emergency earthquake report service started by Weathernews last year. The verified data is analyzed by considering the time, place and intensity of the vibrations in the event of a tremor or earthquake, and becomes the content for users of the service application. As an extension of the project, a database is planned for use in studying things like the effect of earthquakes on the higher levels of buildings, as well as the effect of vibrations from passing trains on buildings. What is the Yure Station Sensor? >The Yure Station was developed in-house by Weathernews to as a special sensor for measuring local movements like shaking and quaking. It connects to any computer with a USB port, and sends a data report to Weathernews every 30 seconds. Acceleration is measured by an internal sensor in the Yure Station that can distinguish between lateral and vertical movement. Additionally, when the Yure Station picks up movement, it responds with a bright blue LED lights fitted inside. The lights flash in a left-right pattern when movement is detected, letting the participating supporter know that it is working. 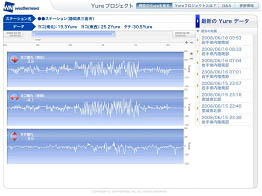 This vibration data is transmitted to Weathernews’ Global Center in Chiba, and displayed on the Yure Project website. What is on the Yure Station website? A map of 1,000 points all over Japan where Yure Stations are installed is displayed on a special map on the Yure Project website. Observation data from each Yure Station is available, so anyone can check the type of movement and intensity detected at each location. The site provides a visualization of the area and severity of earthquakes in Japan that can be read intuitively. Also, the epicenter of an earthquake and other large-scale phenomenon can be checked immediately with concentric circles displayed from data from Weathernews’ emergency earthquake announcement service, The Last 10-Seconds. Other useful information displayed on the site is a list of recent events displayed in chronological order that allows for checking past information. The vibration information from these various locations can also be used to check details of towns and cities displayed on the map of Japan. Clicking on the latest information from the locations listed in the index will bring up a graph of North-South, East-West and vertical movement from which you can see the extent of shaking/quaking over time. In addition, details of the type of construction used for the building in which the Yure Station is installed (wood, steel-reinforced concrete, etc.) is available. This makes it possible to consider their effect on the strength of the vibrations measured.